RoC Retinol Correxion Sensitive Night Cream claims to do a lot of things, improve skin texture, expression lines, photo damage, wrinkles, and radiance. It contains retinol and hyaluronic acid, which of course you know are proven anti-age ingredients. What makes this product different is that it allows people with sensitive skin to take advantage of these ingredients. Retinol is a very irritating product, and you can build up a resistance to it by introducing it to your skin gradually. However those with sensitive skin may find that they can’t use it at all. We tried this on sensitive skin and found it to be far less irritating than regular products. 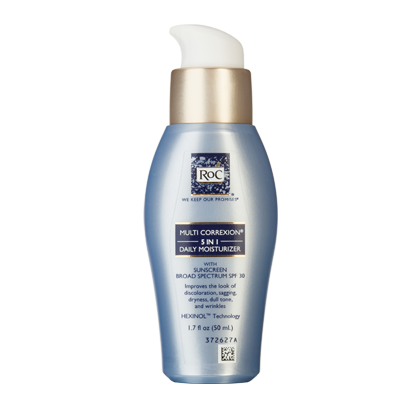 Since this product is geared toward sensitive skin, don’t expect dramatic results right away. After two weeks we saw skin texture and radiance improvement, but no immense improvement in wrinkles. Tip: This product seems to work even better when combined with a regular anti-aging cream.